Our classic baby name blankets with text are soft and cuddly. This blanket makes a great baby gift idea for new baby and parents and comes with a 10-year guarantee. Made from two layers of super-soft, anti-pil 285 gsm fleece, this blanket is non-fray and made by our experts. At Bags of Love, we have over thirteen years of experience making beautiful baby blankets. These terrific baby blankets make perfect personalised christening blankets. You can make a Christening even more special by giving a personalised Christening name blanket. Display the baby's name and date of birth proudly on the custom christening blanket - a baby name blanket that makes for a lifelong keepsake. This will make a great memory gift keepsake blanket to last forever. Baby naming blankets make very sweet gifts and have the quality of an heirloom for the child to grow up with and keep forever. Turn inside out before washing. Iron on the reverse of the printed side. 30°c wash. Low tumble heat. Do not wring. Do not iron. Superior quality and fantastic customer service! I’ve ordered approximately 10 personalised baby name blankets now as gifts for friends over the last couple of years. The quality of these blankets is superb. All my friends have loved these blankets and so have the kids! The customer service is also fantastic. I hope they don’t stop making these as they are my go to baby gift! Love our blanket, very special. Absolutely adored the baby blanket, which I ordered for my brand new nephew. The graffiti design of his name looked fab and his mum and dad were blown away by it. Practical and personal - it doesn't get any better for a newborn baby present! 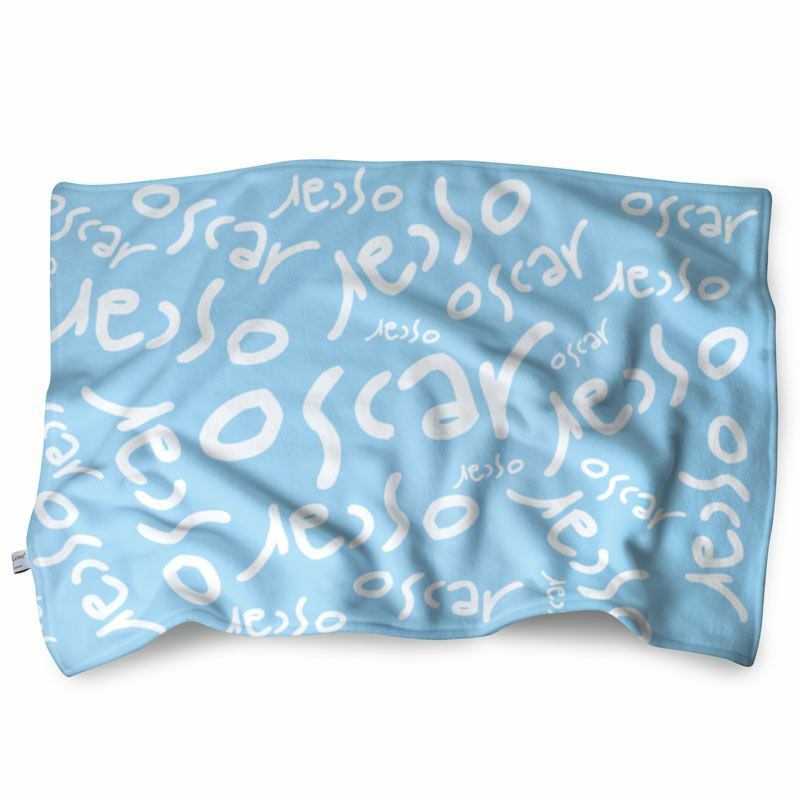 Name baby blankets are perfect for cots, travelling, swaddling, and cuddling. Sumptuous baby name blankets made from two layers of fleece sewn together made to order with a baby name. These baby name blankets are machine washable. Your chosen print and text is fade-resistant for years of usage. Our personalised baby blanket is light and easy to dry. We make your baby blanket with our customary attention to detail one at a time to order here in London. We have an amazing printing ability with the production experience of all our other family related products, not just personalised baby blankets. Care: Machine washable 30°C. Permanent print will not wash out. It also comes with a 10 year guarantee on print & material. Simply click on 'Add to Cart'. Choose the blanket style, colour, 'add text' option and orientation: landscape or portrait. Once you have paid, you will find a text field, where you can add a text of your choice. It's great to add a name to the baby blanket to commemorate the new arrival and is just perfect to introduce the baby to others. Also makes a great gift with the child's name. Add a name to a baby blanket for a special naming gift or christening; these name baby blankets will last years and years, wash after wash.